The team here are a dedicated group of individuals passionate about environmental education and building a sustainable community. Whaingaroa Environment Centre (WEC) was started in 1997 by a group of locals concerned about erosion and other environmental problems in, and around Whaingaroa (Raglan) Harbour. The Whaingaroa Environment Catchment Plan was developed from five years of community discussions and meetings, aimed at creating a sustainable environment. One of the recommendations of the plan was to create an Environment Centre and Whaingaroa Environment Centre (WEC) was established in 1997. We are so glad to be here! Our vision is that Whaingaroa is a healthy, resilient and environmentally sustainable community. Our mission is to be an information, resource and action hub, supporting environmental education and sustainability. 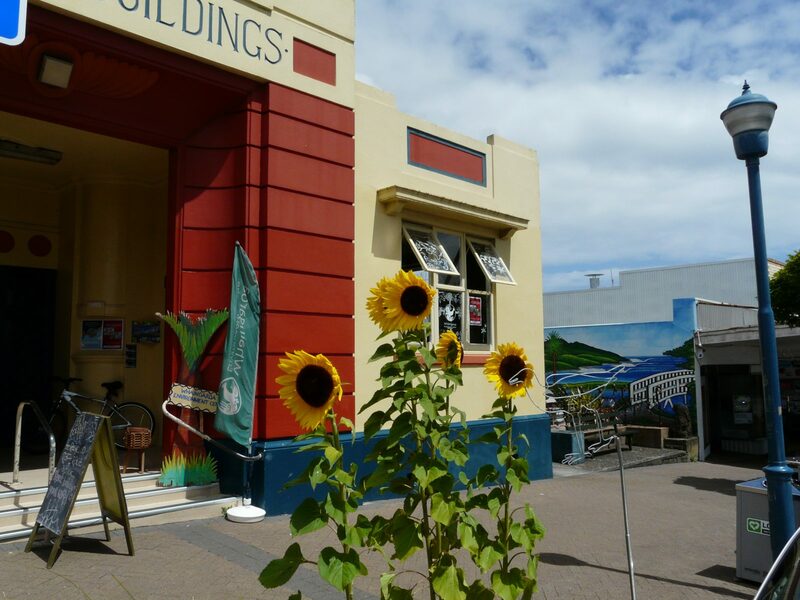 You’ll find us in the Town Hall in Raglan’s main street. We have a range of information is displayed on local environmental issues. We promote environmentally sustainable practices in our community. We deliver environmental education programmes, workshops and raise awareness about environmental issues. We run a range of eco projects with the support of a valuable group of Raglan volunteers. We are a diverse group of locals with differing professions and a united passion for the environment. WEC currently has a committee of four who guide our projects & plans. WEC foundation member, works at Xtreme Zero Waste, local permaculturist, organic farmer and ecologist passionate about composting, re-use and waste reduction. Kia ora, I am of Waikato and Ngāti Maniapoto descent and through both my Parents I Whakapapa to Ngāti Mahanga and Ngāti Wairere. I live in Hamilton, but have spent all of my life holidaying in Whaingaroa where Helen and I and our immediate whanau of nine have owned a permanent Caravan site at Te Kopua for many years. I am a Company Director of multiple Businesses and I have been a Television Producer/Director for over 30 years. I have served on a number of School Boards of Trustees and Committees and I am still involved with many Community groups including my many Marae. I have a passion for the welfare of our Taiao and Environment and I am excited to be a Committee member of the Whaingaroa Environment Centre. Anna’s mission is to inspire and educate people to lead happy, healthy and more environmentally sustainable lives. She has been involved with WEC since 2012 in a number of capacities – coordinator, project contractor and committee member. Anna is currently managing the ECOllective social enterprise project, and organising Maui Dolphin Day. She is also involved in the Raglan Naturally community planning process. When not working in the community you will find Anna playing in her garden or dancing in her kitchen. Supports positive change through facilitating community group strategic planning and cares deeply for the Waitetuna River, our Whaingaroa harbour and it’s coastline. Works at CLIMsystems, Wimmer Design and her own pottery balancing environmental, creative, educational, IT and regenerative design projects. Ella is passionate about the oceans and their health. As such she researches marine debris at the University of Waikato. Ella is also involved with the Raglan citizen scientist project researching (micro) plastics on the beaches in and around the Whaingaroa coastline. Fiona is based in Hamilton, where she works for the Earthquake Commission in the People and Culture team. Like many Hamiltonians, she considers Raglan her local ‘beach’. Fiona is excited to help WEC grow its people and enhance the local environment. Most importantly, are our incredible volunteers across all our projects who make up a critical part of our team. Meet some of our partner organisations and people who support our environmental projects.